Where to Purchase Wholesale Stone Windowsills? As a contractor, you want to stock the best building material that you can afford at the lowest price possible in order to bring in a high margin of profit. That is why most contractors who are on a conservative budget will go with the less expensive window sills that are made from wood, vinyl, or aluminum. Window sills are the lowest form of window casement. It helps brace the entire window while being strategically installed with a slight slope as to drain any water away from the dwelling. This prevents water from coming into the dwelling which would cause rot and mold to the drywall and ultimately the structure of a build if it’s not attended to right away. Without window sills, your property could suffer an exceptional amount of structural damage. You can go to your local home improvement superstore to order the amount of window sills needed for your building project, or you can order window sills from a wholesale distributor. Finding the right wholesale distributor for your building needs can be time consuming, but first, before we go into how to find a good wholesale distributor, let’s take a look at why you ought to consider buying your window sills at wholesale in the first place. Buying in wholesale typically means that you will need to buy in bulk. This means that you’ll be paying a significant amount of money for a large quantity of window sills. This may seem like the exact thing that you don’t want to do, but here is something you need to consider when buying in bulk from most wholesale distributors: the more you buy, oftentimes, you’ll pay less on the unit cost. The challenge of buying window sills in bulk is that your structure may have different size windows. So, it might be difficult to choose a certain amount of sizes to stock. You do have the option of ordering the largest size window sills and then cutting them down to the size you need, but this would cost more money in manpower, which means you’d be losing the money saved from buying bulk window sills at the discounted rate. Stonexchange, a natural stone distributor located in Miami, Florida offers window sills in three standard sizes: 36”, 56”, and 74” in length with a thickness of 5/8”. It can be reasoned that if builders are weary about buying bulk window sills in less expensive material, stocking natural stone window sills in bulk might be a little scarier in terms of upfront costs. Installing stone window sills into your building projects is an upgrade. In the real estate market, most buyers appreciate having stone in their builds any way they can get it. Stone has been known to raise the property value and in terms of incorporating stone into a building structure, window sills are most likely going to be cheaper than installing stone floors or even countertops. Even if you don’t use natural stone for your interior design, that doesn’t mean that you can’t incorporate natural stone window sills. The more sought after natural stone building material typically come in marble and travertine. There are some developments that have been known to incorporate natural stone window sills into a build and use carpet for their flooring and laminate for their countertops. Because stone has such a natural color tone, it complements any build and pairs well with other types of building material given that the right color tones are selected. So if you are a building contractor on a budget, but looking to upgrade the quality of your build in some way while saving money, considering purchasing stone window sills in bulk. The cost up-front will be substantial, but it won’t compare to what you will save if you choose to purchase natural stone window sills on an as-needed basis. What Kind of Stone Window Sills Should I Stock? That’s a good question. You could lose hours of your time trying to choose the perfect window sill in a natural stone distributing warehouse. There are so many variations of color veining in natural stone, that a shade more of one color can change the entire look of the overall surface. So when you’re trying to stock your warehouse with the right kind of natural stone window sills that will appeal to a large number of buyers, you want to be able to choose from a quality selection. Stonexchange has narrowed down our selection of natural stone window sills in marble and travertine to total seven kinds of color variations. These colors range from white, ivory, beige, brown, grey, and black. To view our online inventory, visit our website here. 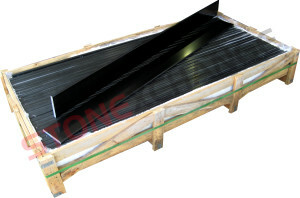 We are confident that stocking a bulk amount of any of these window sills will have a faster turnover rate, meaning you won’t have to worry about any natural stone window sills that you purchase from us to collect dust in your warehouse, provided that you have the clientele to accommodate the bulk supply. We stock all of these options in our Miami warehouse, so we can ship your order out to you within 24 hours provided that it’s a standard order of window sills. Stonexchange also has the ability to manufacture custom window sills for special projects. As we are able to supply you with an immediate shipment of our standard sizes, custom orders need a longer period of lead time as specialized sizes need to be custom cut at our quarry overseas. Call us today at 305- 731-2400 with any questions you may have about placing an order for your natural stone window sills, or contact us through our online form today.